Whether you’re looking for UPVC, aluminium or wooden windows, our team can help. We have an extensive range of styles and colours, including, sash and case, tilt/turn, reversible or casement windows. We can supply and install shaped windows, to suit any shape and size of window. Our products utilise the latest glass technology making your home or business more energy efficient and can help to reduce your energy costs. All McLeod Glazier domestic windows and doors have a 10 year manufacturer guarantee. Commercial window installations are provided with a 12 month guarantee, which can be extended on request. We utilise the latest security systems in our windows, to help make your home secure. Visit our showroom in Perth to see our full range of energy efficient windows. We have a wide range of colours, finishes and handles and hardware. The double-glazed casement window’s enduring popularity in homes throughout the country is due to its versatility and performance. It can be top hung or side opening, depending on customer demands, manufactured with multipoint locking systems and fully reinforced sections exceeding contemporary safety and security demands. McLeod Windows offers a full range of casement windows and enjoys an impressive track record in creating stylish, reliable and customised products. 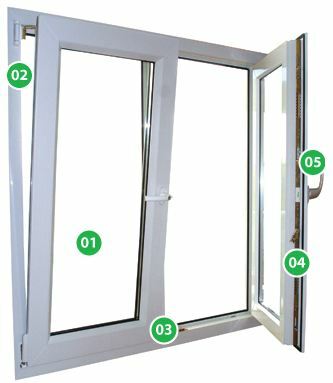 A Casement window has a hinged sash that swings inwards like a door – side-hung, top-hung, occasionally bottom-hung or in a combination of styles – and is also available with fixed panels on one or more sides of the sash. Glazed using innovative thermally efficient glass, our windows will reduce your carbon emissions and your monthly outgoings. Quality tested screws are proven to resist and delay weathering and stand the test of time. 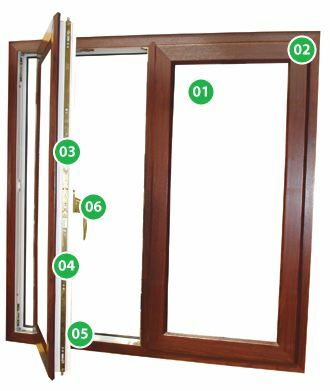 Our casement windows are fitted with a corrosion resistant, multi-point rail lock.  Easy clean, fire escape, and child restricted hinges are available to suit different homes and lifestyles. Locking and non-locking handles are available as well as a push-button system which is ideal for fire escape windows. The reversible double-glazed window follows the same principle as the turn and tilt product, although the sash swings outwards and reverses on itself, allowing the outer pane of glass to be cleaned from inside the room. The reversible window also provides the same fire escape facility offered by turn and tilt. Options Locking and non-locking handles are available as well as a push-button system which is ideal for fire escape windows. The turn and tilt double-glazed window is ideal for the upper floors of houses or flats, meeting the latest fire escape and cleaning regulations. The window has a two-fold operation, with the return position allowing the sash to open inwards like a door, enabling the outer pane of glass to be cleaned from inside the room. 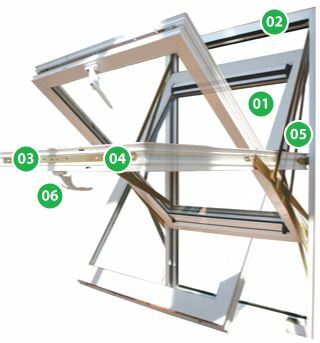 This also provides a fire escape route, with the sash opening fully to expose a clear exit point and the tilt position is ideal for ventilation. The sash and case window design has endured around the globe thanks to classic looks and longevity. In years gone by they were manufactured from timber which, with regular care and attention, ensured a healthy lifespan. But this can be expensive and time-consuming, and doesn’t always guarantee the look and weatherproofing achieved by upvc windows. Now the classic sash and case design can be replicated in upvc, with enhanced insulating properties and no need for constant tender loving care.